The apples are crushed and pressed, the juice is fermented then double distilled over six months before ageing for two years in old neutral oak casks to maintain the fruit aromas rather than to gain oak character. The result is a 40% ABV eau-de-vie; clear and brilliant in the glass with a powerful, fresh, fruity and slightly floral nose. The palate is supple and round with a persistent finish. 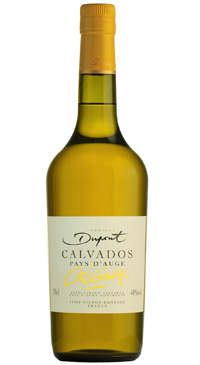 Enjoy this as an aperitif, on its own, over ice or with a drop of water. Makes and excellent eau-de-vie base for cocktails. Serve cold with marinated or smoked fish.